On 7 March 2017, the eve of International Women’s Day, State Street Global Advisors, the asset management business of State Street Corporation, issued a call to more than 3,500 companies they invest in on behalf of their clients to increase the number of women on corporate boards. At the same time the company installed a bronze statue of a determined-looking young Latina girl in Lower Manhattan, staring down the sculpture of the Charging Bull – a long-standing symbol of Wall Street (Friedman, 2017). The Fearless Girl, as it was called, quickly struck a chord with New Yorkers and tourists alike, and generated $millions worth of free publicity for State Street. It also offers us an evocative background against which to summarise our findings and reflect on their implications. 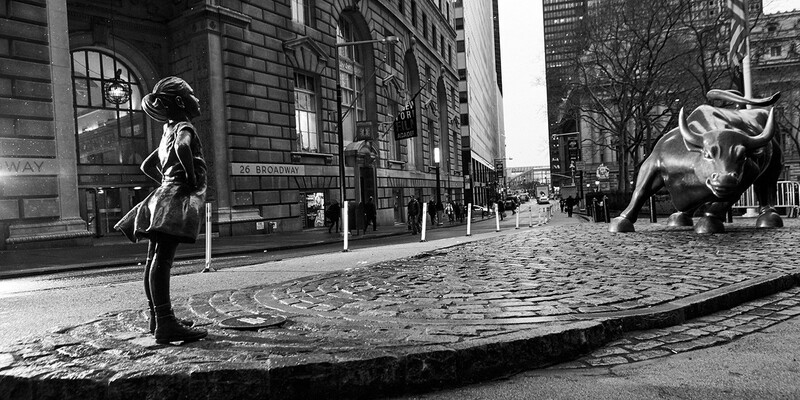 First of all, the Fearless Girl symbolizes the challenge to the lack of diversity, which has corrupted the financial sector, and particularly high finance. As our results show, since 2008 the share of women in the securities industry employment has fallen, while their remuneration and representation in corporate decision-making have improved only marginally. The economic reality of shrinking markets and job cuts prevailed over calls for more diversity. Many financial services companies argue that this is a consequence of the “glass ceiling”, and not a reflection of their remuneration practices at the same job level. The statue paid for by one of the largest asset management firms in the world staring down the icon of Wall Street may also be seen as a symbol of buy-side challenging the sell-side. In this respect, in contrast to the issue of diversity, significant change has already taken place. Buy-side now employs more people than sell-side and is getting close to closing the gap in terms of payroll per person. Although struggling with returns it is able to produce for its beneficiaries, buy-side enjoys a reputation largely untarnished by the global financial crisis, fighting few lawsuits, and basking in the good publicity of an industry performing what it believes to be a clear socially beneficial function. While between 2008 and 2016 New York MSA alone shed over 50k jobs on the sell-side, nearly 10k jobs were created on the buy-side. State Street Global Advisors has for a long time had larger representation of women on their board of directors than other leading asset managers, but buy-side as whole is no better in terms of gender equality than sell-side. In fact, the share of women in total buy-side employment is now significantly lower than before the crisis. Asset management may be staring down investment banking quite successfully in terms of size and power, but there is nothing in this success that brings about any progress in terms of gender equality. The securities industry has undergone significant restructuring under the joint pressures of recession, regulation and technology, but without a much needed cultural change from within. Shrinkage, offshoring, nearshoring, and the rise of the buy-side are all very important, but persistent levels of pay and gender inequality show that culture in the industry has not really changed yet. Culture, including its corporate variety, typically takes long to change, but the fact that the industry has changed so little in important respects for nearly a decade since the crisis must be disappointing. Is it possible that the blow of the crisis is still working its way through financial institutions, and we need to give them more time to change or is intervention from outside needed to enforce change? We might still hope for the former, but action on the latter front is necessary. Read more in the Financial Geography Working Paper #9.